← Why debate at all? One of my favorite all-time movies. 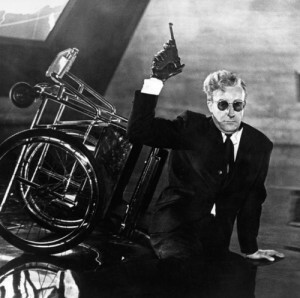 The Dr. Strangelove character, bound to a wheelchair, is loony, delusional, and power-mad with a broad streak of self-loathing. He reminds me of someone. No, not Charles Krauthammer, though that’s a good guess. In unrelated news, I keep going back to Greg Abbott’s announcement, in the sweltering blast furnace heat, of running for governor. He keeps saying Texas, Texas, Texas, as though Heil, Heil, Heil was a little over the top – at least for now. Then later he said he understands Hispanics because he’s married to one. I guess he’s down with black people because he had a conversation with one, or he’s in solidarity with gays because he’s worked with Rick Perry. His statement is odd considering his being married to a woman certainly has not helped him in understanding that group.